Create financial freedom and broaden your horizons. Who can be a successful investor? We all can! You don't have to be an expert to enjoy investment success - all it takes is a planned approach and a sense of commitment. If you're new to investing, you may feel uncertain about where to start. Take a look at our commonsense guidelines to see how straightforward it can be to boost your wealth with a well-constructed portfolio of quality assets. At Citibank, we believe that successful investing begins with a sound and diversified asset allocation plan. Hence, we encourage all investors to have investment portfolios that are sufficiently diversified at all times which will potentially minimize certain risks of investments. Citibank Model Portfolios can help you diversify your investment portfolio and serve you as an asset allocation reference tool both for periodic evaluation and prospective investments. Asset Allocation for your investment through mutual fund. How does it work? It helps to determine how you should allocate your investment in different asset classes through mutual fund in order to achieve a balance between risk and return. While the asset allocation for your investment through mutual fund approach is based on portfolio optimization which aims to minimize risk for any given level of return, it does not eliminate risk or capital loss, or promise any predetermined return or risk level. To help you with choosing the right fund for your portfolio, we present Citi's view on asset allocation, along with a selection of mutual funds for your diversification beyond the local equity market. 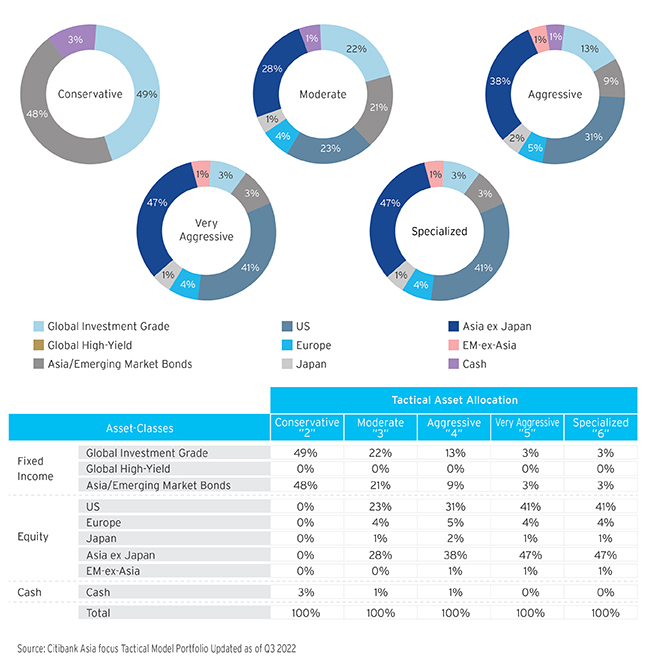 Table below describes Citibank's investor risk profile. IR1 Safety Oriented Investors who hope to experience no more than minimal losses in portfolio value over a one year period and are generally only willing to buy investments that are priced frequently and have a high certainty of being able to sell quickly (less than a week) at a price close to the recently observed market value. IR2 Conservative Investors who hope to experience no more than small portfolio losses over a one-year period and are generally only willing to buy investments that are priced frequently and have a high certainty of being able to sell quickly (less than a week) although the investor may at times buy individual investments that entail greater risk. IR4 Aggressive Investors who are prepared to accept greater portfolio losses over a one year period while attempting to enhance longer-term performance and are willing to buy investments or enter into contracts that may be difficult to sell or close within a short time-frame or have an uncertain realizable value at any given time. IR6 Specialized Investing Investors who are prepared to put their entire portfolio at risk over a one year period, and may even be required to provide additional capital to make up for portfolio losses beyond the amount initially invested, are generally willing to buy investments or enter into contracts that may be difficult to sell or close for an extended period or have an uncertain realizable value at any given time. Visit any of our branches today. 399 Interchange 21 Building, Sukhumvit Road, Klongtoey Nua Sub-district, Wattana District, Bangkok 10110. 4, 4/1-2, 4/4, 4th floor, Room B411-2 (Bank zone), Rajdamri Road, Pathumwan Sub-district, Pathumwan District, Bangkok 10330. Investment products are (a) not insured by any government agency; (b) not a deposit or other obligation of, or guaranteed by, the depository institution; and (c) subject to investment risks, including possible loss of the principal amount invested. Past performance is not indicative of future results: prices can go up or down. This is neither an offer nor solicitation to purchase or sell any security, other investment or service or to attract any funds or deposits. This document does not constitute the distribution of any information or the making of any offer or solicitation by any one in any jurisdiction in which such distribution or offer is not authorized or to any person to whom it is unlawful to distribute such document or make any offer or solicitation. Investors investing in investment products denominated in non-local currency should be aware of the risk of exchange rate fluctuations that may cause a loss of principal. Investment products are not available to US Persons and may not be available in all jurisdictions. Portfolio diversification is an important element for an investor to consider when making investment decisions. Concentrated positions may entail greater risks than a diversified portfolio. Certain factors that affect the assessment of whether your overall investment portfolio is sufficiently diversified may not be evident from a review of only your account with Citibank. It therefore is important that you carefully review your entire investment portfolio to ensure that it meets your investment goals and is within your risk tolerance, including your objectives for asset and issuer diversification. To discuss your asset allocations and potential strategies to reduce the risk and/or volatility of a concentrated position, please contact your personal banker/relationship manager. Citibank's Model Portfolio is not a program or offering, but is a diversification tool that is meant for reference purposes only. Model Portfolios are: (i) not binding on the part of the customers; (ii) not monitored by Citibank with respect to customers' individual investment holdings; and (iii) not personalized to the specific needs of any individual customer. Citibank's Model Portfolios are not available to US Persons and may not be available in all jurisdictions. This document is for information only and does not constitute an invitation or offer to acquire, purchase or subscribe for any securities, investment or service, or to attract any funds or deposits. The information contained in this document does not constitute an offer for sale in any jurisdiction in which such offer is or may be prohibited, restricted or subject to any requirement for filing, authorization, license or consent. While Citibank, N.A. Bangkok Branch has taken reasonable care to ensure that the information in this document is accurate at the date of this document, Citibank, N.A. Bangkok Branch accepts no liability for the accuracy or completeness or use or reliance of, nor any liability to update, the information contained in this document. In particular, actual results and developments may be materially different from any forecast, forward-looking statement, opinion or expectation expressed in this document. You acknowledge and agree that the "Model Portfolio(s)" referred to in this document are merely references to illustrations of recommended asset allocations based on your risk profile and investment objectives and that such "Model Portfolio(s)" are not personalized to your specific investment needs. The "Model Portfolio(s)" are arrived at and are provided to you without having regard to any underlying portfolio of investments which you may have or hold. You further acknowledge and agree that these "Model Portfolio(s)" are provided as at a specific point in time and will not be actively monitored by Citibank, N.A. Bangkok Branch with respect to your individual investment holdings and that Citibank, N.A. Bangkok Branch does not undertake to, and is not obliged to, undertake a review, manage or monitor your investment holdings or to track your investment holdings against any "Model Portfolio". You also acknowledge and agree that no investment advisory or fund management services are being provided to you by virtue of the "Model Portfolio(s)" and that you will be solely responsible for your own decisions on investments and you will not rely on Citibank, N.A. Bangkok Branch or any of its agents, officers or employees in any way in relation to such investments and/or the asset allocation of your investments. This Citibank Model Portfolios contains general information and insights distributed in Thailand by Citigroup and are made available in English language only. Citi does not dictate or solicit investment in any specific securities and similar products. Investment contains certain risk, please study prospectus before investing. Not an obligation of, or guaranteed by, Citibank. Not bank deposits. Subject to investment risks, including possible loss of the principal amount invested. Subject to price fluctuation. Past performance does not guarantee future performance. Not offered to US persons. This Citibank Model Portfolios is provided as guidance for your investment through mutual fund only without any legal binding, responsibility or liability between you and Citibank, N.A. Bangkok Branch. It is also subjected to your individual risk profile and must be in compliance with the SEC's regulations as usual.